In a medium bowl, combine all dough ingredients, except butter. Do not over mix. Divide dough into 24 equal portions, shape into balls and place in a mini muffin pan. Lightly brush melted butter onto each roll. Bake for 20 minutes. Cool for 5 minutes. While rolls are baking, whisk together cranberry sauce, honey and mustard. Set aside. Cut off white rind of brie and slice cheese into ¼-inch slices. Cut ham into slices the size of the roll. Slice rolls in half. 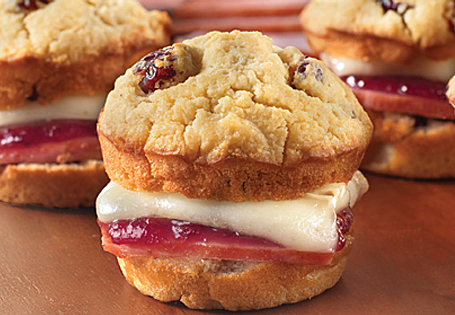 On each bottom half, place a slice of ham and 1 teaspoon of cranberry-honey mustard. On each top, place a slice of brie. Place open-faced sandwiches on a parchment-lined cookie sheet. Bake for 5 minutes. Place tops on sandwiches, serve warm.